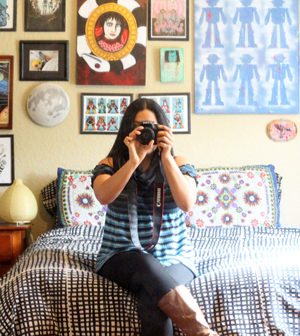 There's a flurry of activity going on right now in the creative and thrifty community. Everyone is working hard on blogging, reselling, art and craft goals! Just like you, I have so many ideas it's hard to get started. This summer I'm going to focus and get to work, streamlining the ideas into action steps and hitting them! For all of June I'm going to write business goal related articles. I'm going to interview successful creatives that turned thrifting and art into successful careers and I'm also going to write plenty to help you with your own goals and inspire you to reach your dreams. Let's get it this summer, Rawr! Set up an organized "office space", write up my business goals, and divide them into actions steps. Gotta sell all of the merchandise I've acquired! All stock must go! Update portfolio with all my current work and writing samples AND apply for more writing gigs. Continue with plans to monetize Thrift Core. I'm brainstorming on a new art line, time to get to work and complete it! 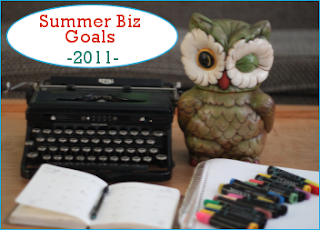 What are Your Business Goals for Summer 2011? Optional Button: Copy + Paste the code to display the button. Tag, you're it! Write a blog post with your Summer Goals or leave your goals in the comments. You can use the button above in your post or in your website if you desire. Let's get serious and hit all of our goals this year! Stray Dog Strut: I'd love to make enough merch to sell at a con or art market before the end of the year. We've gotta work all summer to achieve that lofty aim! Ha! Good luck to you! Dhamma: It's tricky to write your list and get to it! I'm forcing myself to do it for June though, time to get serious and work it! Ha! How about get a job? No, seriously...definitely getting organized is my constant goal. Zootsuitmama: Me too! I'll be writing plenty of organization inspiration tips along the way! I need 'em! Stampin D Amour: I want a bigger booth, too! But first I'm going to attempt (using bits to add levels to my bookshelf/booth) to make the most of my space. summer goals... I really need to do this too. The problem is I LOVE making lists. To the point that I remember so many projects that are 'in the works' that I get overwhelmed with where to start. Maybe I'll go public with it and it'll keep me on target! i would LOVE to sell through my thrifted items on my shop and try to get my animal pendants to work! they are giving me such trouble! CB: Keep at it, and keep blogging your process. Seeing your progress on your blog is very inspirational! hey van, you are so motivated and ramping up just as i'm starting to chill out and cut back on my commitments for the summer :) glad i'll have some inspiring things to read from you! hey van! thanks for the wonderful comment! i thought what you wrote on my blog was very interesting and really helpful! if you have any more pointers for me i would LOVE to hear them! getting help from a wonderful successful lady like you is so awesome! i love the blogging world! I have the same goals that you all have plus one more: I use my iphone ultimate calendar app and have been making displays showcasing items in my booth. For example, today June 7, is VCR day so I placed a VCR on my table with all kinds of vcr movies surrounding it. I placed a sign in the middle with an explanation of the "holiday": the history of the VCR. Nope, didn't sell a thing! but... the customers liked my sign and it was a great conversation piece. So my goal for the summer is to create special displays with the holidays and see if I can increase interest and sales! Ana: Summer is a good time to ramp up for Holiday crafting and stock making! Gonna keep riding the wave of inspiration! CB: Thank you! I'll cover it more later, but I've noticed the people who are most successful are the ones who have a huge variety of stock available, so I'm making it a numbers game to see what happens. May: I'm glad it's all been helpful, thank you for the kind words! Diana: Excellent idea! Thanks for sharing. I'm going to make a sign and try to play with staging and displays more as well. With Antique Store Booths it's fun to experiment and gauge reactions!